Hossein Omoumi was born in 1944, in Isfahân, Iran, and began his musical education singing with his father. 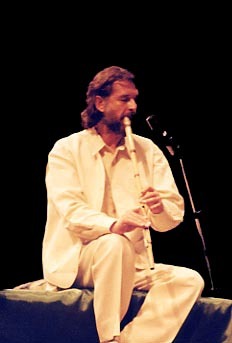 At age 14, he started studying the Ney, the traditional reed flute of Iran. While studying architecture, he was accepted as a tutorial student at the National Superior Conservatory of Music in Tehran, and worked with great masters Mahmud Karimi and Farhâd Fakhreddini. He then worked with the great master of Ney Hassan Kassâei. Omoumi’s performance career has included appearances at many of major festivals and concert halls in Europe and the United States, including San Francisco’s World Music Festival, UCLA’s Schoenberg Hall and Wadsworth Theater, the Getty Center in Los Angeles, the World Music Institute and Asia Society in New York, and Theatre de la Ville in Paris.